I’ve been struggling with this post since yesterday morning. I knew I had to say something, but what? What can be said about this truly awful event? I’m sure you’ve all heard about it, the news has been on this like dirt on my toddler’s shirt. There have been tweets and facebook statuses and news reports galore. I can’t possibly add any more. At the same time, I can’t possibly ignore it. This is shaping up to be the worst natural disaster in Alberta history. The floods of 2005 previously held that title, but this has been so much more devastating. 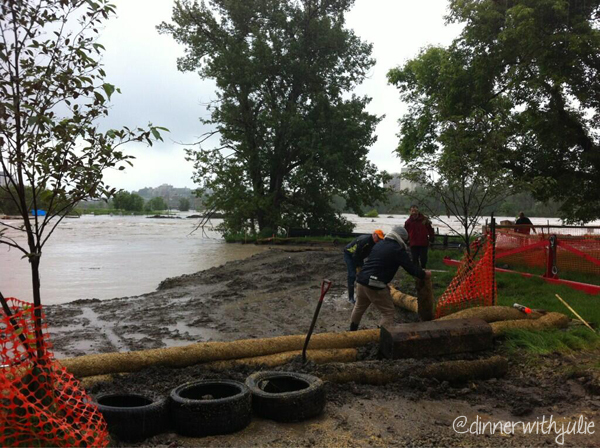 Over 100,000 people displaced through southern Alberta, and 24 municipalities declaring states of emergency. 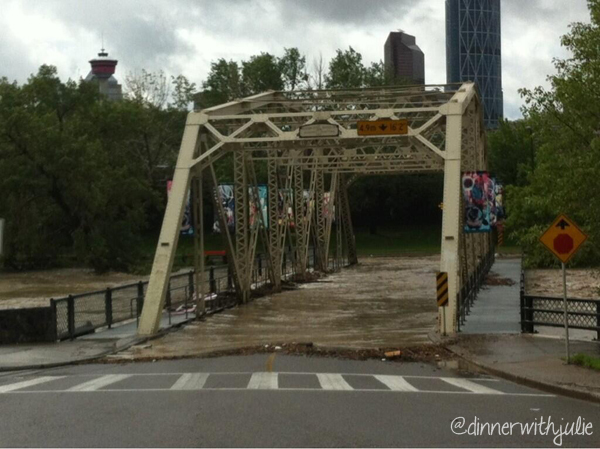 In Calgary alone, 75,000 people in 25 communities were evacuated, many with very little notice. The entire downtown core was shut down on Friday, and may not re-open until the middle of next week. The Stampede grounds (pictured above, photo courtesy of Merry With Children and used with permission) are covered in water, and the Saddledome is essentially a swimming pool, submerged up to at least row 10. Entire neighbourhoods are under water, or threatened by massive amounts of erosion along the banks of the swollen rivers. Here are a few photos courtesy of Julie Van Rosendaal (again, used with permission), that show an up-close-and-personal perspective of the flooding. 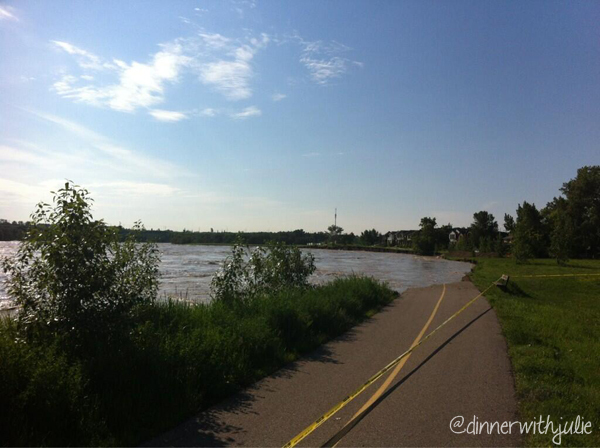 @CalgaryCrossFit @LisaKadane @InglewoodYYC still clear of the houses, but scary pic. What compounds this disaster is a lack of insurance. Overland flooding insurance doesn’t exist in Canada. It’s simple, really – the point of insurance is to take the risks of many and spread it out. Unfortunately, flooding is a risk only to those in flood zones, and as such the risk is not actually held by a large percentage of the population. It’s going to take a long time for us to recover, but we will. Would you like to help? Keep reading. Donate to the Red Cross to help flood relief efforts. You can donate by calling the Red Cross at 1-800-418-1111 or online at http://www.redcross.ca. Last but not least: visit. 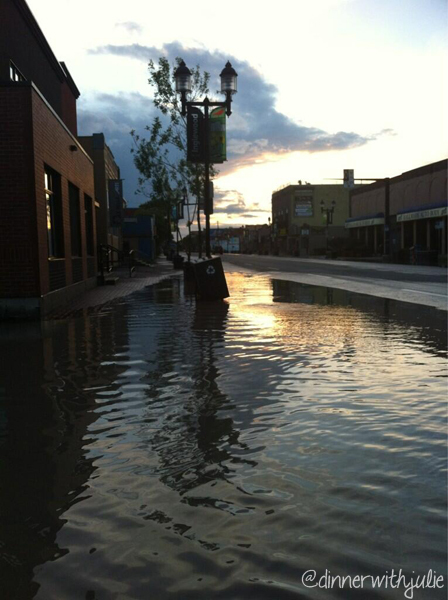 Come to Calgary, Canmore, Medicine Hat, and other affected communities after we have recovered. Spend your travel dollars here. The effects of this disaster will be felt by our citizens and businesses for many years to come, so show your support and come on out. We promise you some good ol’ Alberta hospitality when you do. This entry was posted in Blah blah blah on June 22, 2013 by Samantha.